Who here loves to snore? Nobody? 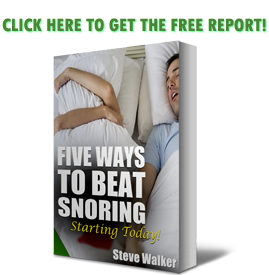 With all the problems and issues created by snoring, you are not the only one affected. Your partner is likely bothered by it as well, and SleepPro Standard might just be what the doctor ordered. Snoring creates noise issues that make it hard for you and your partner to fall and stay asleep. Nothing is more valuable than a good night's sleep. The sheer amount of snoring mouthpieces on the market stands as a testament to the seriousness of the issue at hand.. The central theme of the film from 2005 called '˜Robots' is 'See a need, fill a need. ' That is exactly what the market is trying to do with the abundance of snoring mouthpieces currently out there. Solving snoring issues is not an easy task. It certainly requires a certain level of specialized education and research. 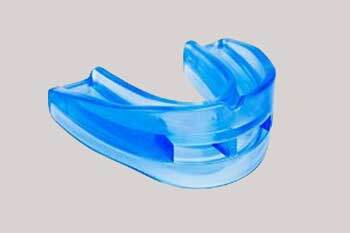 The first anti-snoring mouthpieces were horrendous devices that cost a fortune. Just thinking about them gives me shivers. However, that was 40 years ago and people and technology have come a long way. Snoring mouthpieces these days are much more comfortable. 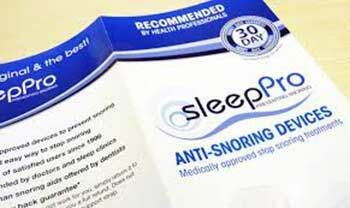 Having the ability to order these items online, snoring issues have become much more private. Those who would be embarrassed or ashamed of revealing problems to their doctor or dentist have jumped at the chance to solve their issues without any intervention by other human beings. When the 'dot com' boom of the early 2000s was in full swing it was touted as being simple and easy; something you could do while sitting at home in your underwear. People are free to buy from the comfort of their own homes without ever paying a visit to a dentist. There are several different mouthpieces that claim to solve the snoring issue that people can choose from. SleepPro is one of those mouthpieces.. In marketing, they say you need to be the red brick in the yellow brick road. In other words, your product needs to stand out from your competitors. Let's see what makes SleepPro the red brick in that yellow road. SleepPro is owned by a company of the same name. The SleepPro Company is owned and operated by MEDiTAS in the United Kingdom. Their 'About Us' page, which I always visit first when visiting a website, reads more like a corporate mission statement. That causes the company to feel less personable and relatable. I did find out they started their business in 1998 which is an age that tells me more about a company. Seventeen years in business is nothing to laugh at as being in business for over a decade takes hard work and dedication. 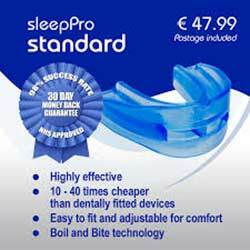 There are several different versions of the SleepPro available including a female-only version. For the purposes of this article, we are going to look at the SleepPro Standard. The SleepPro Standard mouthpiece is a simple thermoplastic design. Often called 'boil and bite' technology, it creates a custom mold for your mouth by boiling the mouthpiece, biting down, and submerging it in cold water which allows the plastic to keep the shape of your mouth. It is a cost-effective way to create a custom mouthpiece. This is considered a Mandibular Advancement Device (MAD). These devices are designed to hold your lower jaw in a forward position, separating your palette from the back of your throat. This opens the airways and prevents snoring. The SleepPro Standard features a small hole in the front called a blowhole, which allows you to breathe through your mouth as you sleep. If you have any experience with MADs, you'll know that the breathing holes in the front are not a standard feature; they are a perk. After you create a custom molding with the outline of your mouth, clean it and put it away until you are ready to go to bed. When you do make it to bed for the evening, insert the mouthpiece into your mouth and keep it there overnight. During the first few nights that you use this device you may experience excessive salivation. This is normal and expected behavior. I've always suggested putting a small hand towel between your head and your pillow for those first few nights. Another side effect you might experience is a slight soreness in your jaw the next morning. This is also expected behavior as you grow accustomed to having the device in your mouth every night. The soreness is a result of the device doing its job; forcing a new position of your lower jaw so you do not snore anymore. For such a simple design, SleepPro Standard works. There has been feedback from both sides. On the positive side, we have people who love the product. It is cheaper than some alternatives on the market with the same effectiveness as if they had gone to the dentist. There have been claims of 98% satisfaction. Of course, this sounds very high, and I would take it with a grain of salt. Meanwhile, the negative side does not feel too hot about it, citing a lack of comfort as reason enough to stay away. One of the people on the negative side said it did not help their sleep apnea. This is a red flag because this product was not meant to cure sleep apnea. It may help obstructive sleep apnea, but if you have central sleep apnea, you need to see a specialist about a Continuous Positive Airway Pressure (CPAP) machine. One of the major features that make this different than other MADs is the large breathing hole in the front. Not all MADs have this convenient feature. Some force you to breathe through your nose which can be an issue for many. The website claims to be 'Medically Approved', however it has not been cleared by the FDA. The UK has different health standards than the United States, and since this is manufactured outside the US, it makes sense to not have FDA clearance. I am not sure how credible their 'Medically Approved' claim is. However, they have been in business for 17 years as of 2015. If they sold an unsafe product, they would not have lasted half that long. Price is one of the biggest advantages of this mouthpiece. SleepPro Standard will set you back by $49.99, making this less expensive than many on the market. The price per piece goes down even more when you find out that you can get a second one for an additional $20. It comes from the United Kingdom so that add a reasonable shipping charge of $10.25. It also comes with a 30-day money back guarantee, which is as close as you can get to a 'try before you buy' feature. This proves they are willing to stand behind their product. This device may work for you, and it might not. With its cheap price, simple design, and 30-day money back guarantee, it is perfect if you are looking for your first mouthpiece. It is an excellent way to test yourself to see if MADs are right for you.